When right clicking an empty map, the rotation will the way the player is facing (if the player is facing south, the maps north will be at the bottom). However, a player can add an item frame in the slot below the plus sign on the cartography table with a map to rotate the map. A rotate button will appear on the bottom middle of the map displayed on the cartography table. A player can rotate the map as much as they want in a cycle of 4 rotations until they retrieve the map. Compasses now face north naturally so the player can make sure if a map is facing the right direction because the non-reduced debug screen will be removed and only accessible through cheats. Right clicking banners with maps in 1.13 adds a waypoint to the map. Players should be able to place a banner in the slot below the plus sign of the cartography table to add a waypoint to the map. When hovering over the map displayed in the cartography table, a transparent banner will appear. When the player clicks, the banner will placed (has to be placed on 1 block, not in between 2). Banners cannot be placed on parts of the map that aren't discovered. Considering the lack of uses the cartography table has currently, this feature seems appropriate for the cartography table. Players are able to trade 1 incomplete map and 2-4 emeralds with a cartographer to complete a map.This trade is unlocked when a villager becomes a journeyman (level 3). Maps will no longer appear as a note in the players inventory but rather as the map itself. 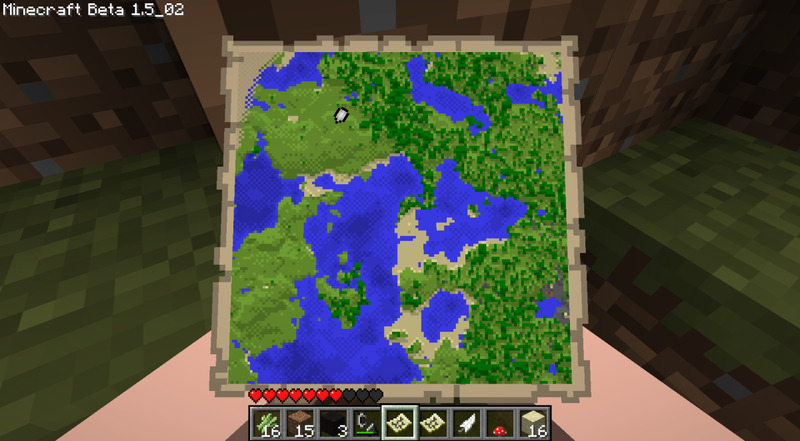 However, a player can only map new land when holding a map in one of their hands. Now, when a player has another item besides a map in their main or offhand, the map appears like the picture on the left. However, when there is no item besides 1 map in the players off and main hand, the item appears like the picture on the right. If a player picks up an item while holding a map in both hands, the item will not go into the slot which is highlighted unless it is the only slot available. When right clicking an empty map, the block the player is on will be the center of the map. I don't understand the technical limitations of this feature, but I would appreciate feedback from someone who does. A player will still have the ability to make maps have the default boundaries to make it easier to map adjacent maps. All they need to do is add a stone block to the map via a cartography table. Compasses now have 238 durability. First of all, coordinates are removed and can only be accessible through cheats. See my functions thread in the signature for more information. When only a waypoint is on a map, a player can hold a compass in one hand and a map in the other and the compass will lead to the waypoint. The player will need to right click for the compass to point to the waypoint consuming 1 durability. If there are multiple, the compass will chose the closest waypoint. Right clicking the compass will change the waypoint to the closest clockwise from the first way point and consume 1 durability. A player can keep right clicking to cycle through way points. The arrow on the map that moves around as the player moves around is removed so the player is dependent on the compass to easily locate places. If a player is near the end, the needle on the compass will start crazily going back and forth and in circles. The level of craziness gets higher the closer the player is to the the end portal. I like all of this and support it. I think the maps work on a grid because it is easier to map adjacent maps that way. If it always centered on where the player made a map, you would need to make sure you travel the EXACT perfect distance to make your next map or there would be overlap between the two maps on their connecting edge. I'm think it also has something to do with how map data is stored but not sure. You would need a way to make new adjacent maps snap perfectly to the existing map to fix the overlap problem. Maybe if you put your existing map in the center of a 3x3 crafting grid and a blank map of the same zoom level in one of the surrounding slots, it will set that map's origin point to whatever is the correct location so they line up right? Since the cartography table will now handle the cloning of maps, that seems the most functional. Perhaps a new UI item could be added to the table that lets you define extra info according to what the current "plus" item is? This could perhaps take advantage of the accessibility features recently added in 19w11a. For example, the shears could allow you to specify the zoom level to jump to allowing you to crop down more than one level at a time (probably 1 durability per level changed?). Paper or empty maps could be used similarly to zoom outwards (again, one item per level moved). An unnamed banner could allow you to specify the waypoint coordinates, leaving it blank would default to current location. And a compass (not consumed, but perhaps a durability would be added to the item that decrements by 1 for each change) could allow you to cycle through multiple waypoints. Thanks for the support. The feature has been added. The suggested changes would actually make setting waypoints easier as you can just add it via cartography table to a location far away from you. I do not understand your coordinates suggestion. Durability for compasses sounds like a good idea considering the power of the suggested ability. 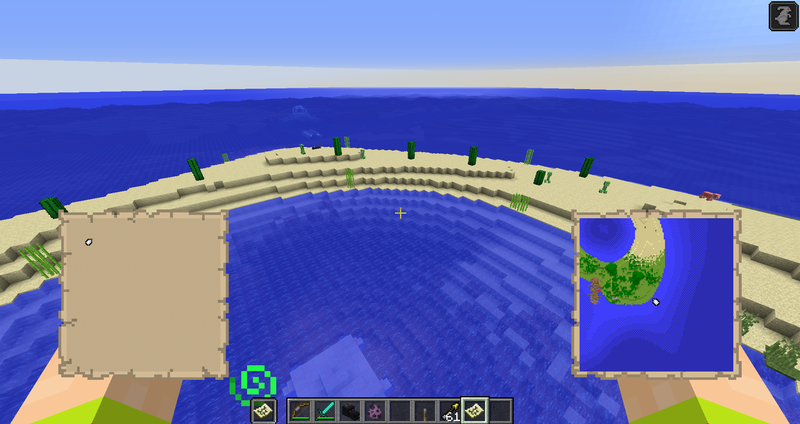 However, I will need to add more uses to the compass. Rotating maps and new compass features have been added.